Location: The ancient Delphi Archaeological Site on the plateau of Mount Parnassus, Greece. Description of Event: Adina will give a spiritual workshop combining Hridaya Meditation, teachings, and practice—offering an experience from the profound depth of the Spiritual Heart and the Naturalness of Rigpa. 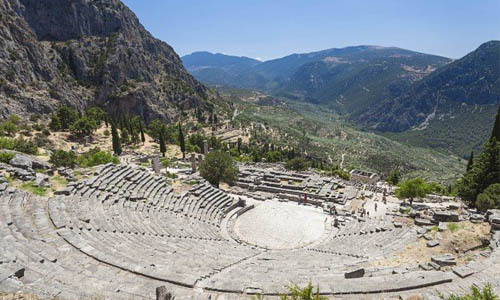 The event will be presented at the Oracle of Delphi Sanctuary, overlooking the valley. The program includes a walking meditation around the ancient site and will close with sungazing at sunset. Adina will offer a love-born birthday cake at midnight on the New Moon to celebrate her 42nd birthday! Cost: Adina is offering the workshop as Karma Yoga. Therefore, the event is free of charge. Accommodation: Lodging is available within walking distance at Parnassos, Acropole, and a few other affordable hotels in Delphi. Please book your accommodation independently. Contact Information: For more information, please contact Adina at adina@satyasattva.com or +1 904-613-8969.